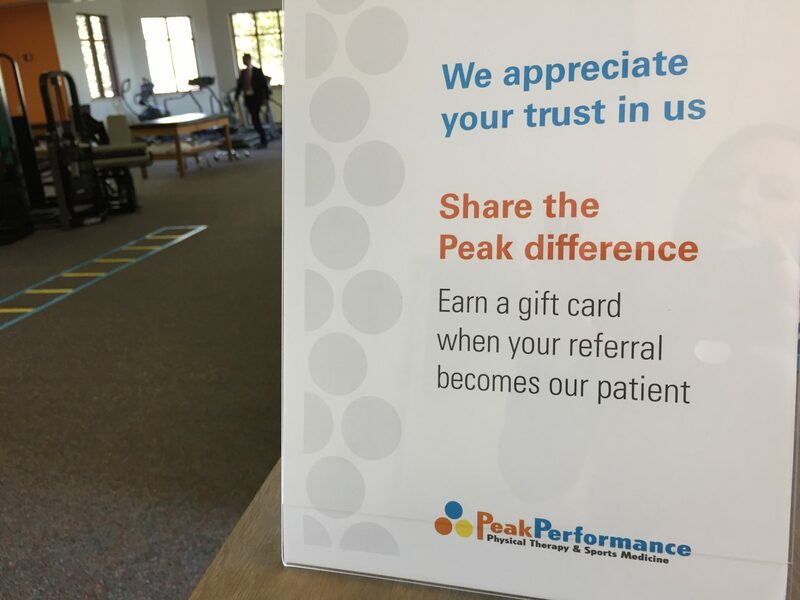 About a year ago, our team of physical therapists at Peak Performance decided to start a patient referral program. The program we created is simple. For every referral that schedules and physical therapy appointment and then becomes a patient, we provide a gift card from a local business to the person who referred. Within the first few months of launching the program, we began to notice a common pattern of behaviors among patients. They referred the people in their closest inner circles: their spouses, parents, children and best friends. We started to talk among ourselves about this discovery. What did we do as therapists to earn a level of trust that led them to referring people they care about? Was it the physical therapy, the relationship, or a delicate balance of the two? We didn’t know the answer, so we turned to our patients to learn what is important in physical therapy care. After a patient received a gift card, we asked them to share their reasons for recommending us. Here are a few common themes that surfaced as we talked to people who referred. Specialization: Our therapists cover the full spectrum of physical therapy, as well as specialties. This means we can tap into our expertise for the benefit of all patients. For example, a patient was receiving therapy from Brad McMahon for her shoulder. She also described her issues with severe headaches. Brad recommended a specialty, dry needling, which provided relief and eliminated her need for medications. This patient has shared her experience on social media and has referred several friends to the practice. One Clinic Location: As a mid-sized practice with one location, our therapists can be aware of every person who comes to the practice. Our patients described how they liked how the entire team knew their names and a little about them. We use our one-clinic location as a point of difference and have discovered that they will travel for the best care. As one patient states, “I live two miles from another physical therapy clinic. I drive 82 miles from Green Bay to Peak Performance twice a week because the staff is awesome.” Other patients describe our clinic as professional (comfortable) environment and a staff with impressive credentials. We are so fortunate to have developed a level of trust with our patients that encourages them to recommend people who are important in their lives. Now that we know the reasons behind their referral, we can say with confidence that we are recommended by family and friends you know and trust! To schedule a physical therapy appointment, contact Denise or Paula (patient care coordinators) at (920) 738-0671.